With William Broyles, Jr.'s script, Burton was hired as director, and the film was put into active development. Lawrence Konner and Mark Rosenthal rewrote the script, and filming took place from November 2000 to April 2001. Planet of the Apes was released to mixed reviews, but was a financial success. Much criticism focused on the confusing plot and ending, although Rick Baker's prosthetic makeup designs were praised. 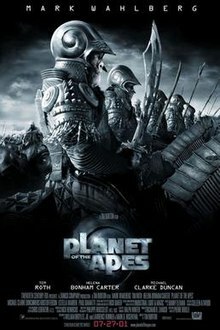 Despite its financial success, 20th Century Fox chose not to produce a sequel, and later rebooted the franchise in 2011 with Rise of the Planet of the Apes. In 2029, aboard the United States Air Force space station Oberon, Leo Davidson works closely with primates who are trained for space missions. His favorite simian co-worker is a chimpanzee named Pericles. With a deadly electromagnetic storm approaching the station, a small space pod piloted by Pericles is used to probe the storm. Pericles's pod heads into the storm and disappears. Against his commanding officer's orders, Leo takes a second pod and goes in pursuit of Pericles. Entering the storm, Leo loses contact with the Oberon and crashes on a planet called Ashlar in the year 5021. He discovers that the world is ruled by humanoid apes who speak English, use domesticated horses for transportation, and treat human beings as slaves. Leo comes across a female chimpanzee named Ari, who protests the awful treatment humans receive. Ari decides to buy Leo and a female slave named Daena to have them work as servants in the house of her father, Senator Sandar. Leo escapes his cage and frees other humans. Limbo, a slave trader in captured humans, sees them but is taken prisoner to ensure his silence. General Thade and Colonel Attar march ape warriors in pursuit of the humans. Leo discovers Calima, the forbidden, but holy temple of "Semos", the first ape whom the apes revere as a god. Calima turns out to be the remains of the Oberon which had crashed on the planet's surface and now looks ancient (the name Calima coming from the sign "CAution LIve aniMAls", the relevant letters being the only ones not covered in dust). According to the computer logs, the station has been there for thousands of years. Leo deduces that when he entered the vortex he was pushed forward in time, while the Oberon, searching after him, was not, crashing on the planet long before he did. The Oberon's log reveals that the apes on board, led by Semos, organized a mutiny and took control of the vessel after it crashed. The human and ape survivors of the struggle left the ship and their descendants are the people Leo has encountered since landing. The apes arrive and attack the humans who have gathered to see Leo, although he is able to even the odds when he uses the Oberon's last fragments of fuel to fire a final blast at the first wave of apes. The battle is halted as a familiar vehicle descends from the sky and is identified immediately by Leo. The pod is piloted by Pericles, the chimp astronaut. Pericles was pushed forward in time as Leo was, and had just now found his way to the planet. When Pericles lands and the pod opens, the apes interpret his arrival as the return of Semos. They bow, and hostilities between humans and apes suddenly cease. Pericles runs into the wreck of the Oberon and Leo runs after him, followed by General Thade. Thade and Leo fight. Pericles tries to help Leo, but Thade throws him hard against a wall. Thade takes Leo's gun from him and tries to fire it at Leo. Leo sees that Thade is within the pilot's deck and closes the automatic door, trapping Thade inside. Thade fires the gun repeatedly at the door but the ricochets create sparks that scare Thade, who huddles under a control panel. Leo decides to escape Ashlar and return to Earth. He gives Pericles to Ari, who promises to look after him. He says goodbye and kisses Ari and Daena. Leo climbs aboard Pericles's undamaged pod and travels back in time through the same electromagnetic storm, and crashes in Washington, D.C. on Earth. He looks up at what appears to be the Lincoln Memorial, only to find that it is now a monument to General Thade. Leo is descended upon by a swarm of police officers, firefighters, and news reporters, all of whom are apes. A female chimpanzee who protests the way humans are treated. She helps Leo lead the rebellion, and also develops a romantic attraction to him. A female slave who, like Ari, develops a romantic attraction to Leo. A gorilla and former military leader whose career had been destroyed by Thade. Krull became a servant of Senator Sandar and assisted the humans in their rebellion. A trained chimpanzee in a US Air Force program in 2029, working with Leo on the space station to fly space pods. He is launched on a mission that involves traveling through an electromagnetic storm. He appears in only a few scenes, interacting mainly with Leo and in the ending scene with Ari. Small roles include David Warner (Senator Sandar), Lisa Marie (Nova), Erick Avari (Tival), Luke Eberl (Birn), Evan Parke (Gunnar), Glenn Shadix (Senator Nado), Freda Foh Shen (Bon), Chris Ellis (Lt. Gen. Karl Vasich) and Anne Ramsay (Lt. Col. Grace Alexander). There are also cameo appearances by Charlton Heston (uncredited) as Zaius, Thade's father, and Linda Harrison (the woman in the cart). Both participated in the first two films in the original series, Planet of the Apes (1968) and Beneath the Planet of the Apes (1970) as George Taylor and Nova, respectively. ^ "PLANET OF THE APES (12)". British Board of Film Classification. July 26, 2001. Retrieved June 24, 2015. ^ a b c d "Planet of the Apes". Box Office Mojo. Retrieved September 28, 2008. ^ Michael Fleming (September 11, 2000). "Inside Move: Strikes cause A-list shuffles". Variety. Retrieved September 30, 2008. ^ KJB (June 29, 2000). "Mark Wahlberg Signs on to Planet of the Apes". IGN. Retrieved October 2, 2008. ^ a b Steven Horn (July 31, 2001). "Interview with Mark Wahlberg". IGN. Retrieved October 2, 2008. ^ Shawn Adler (December 7, 2007). "What Would "Potter" Have Been Like With Tim Roth As Snape?". MTV. Retrieved December 8, 2007. ^ Steven Horn (August 1, 2001). "Interview with Tim Roth". IGN. Retrieved October 1, 2008. ^ Michael Fleming (August 8, 2000). "U to replant Flowers". Variety. Retrieved September 30, 2008. ^ a b c Steven Horn (August 2, 2001). "Interview with Paul Giamatti". IGN. Retrieved October 1, 2008. ^ a b c d e f g David Hughes (March 2004). Tales From Development Hell. London: Titan Books. pp. 34–37. ISBN 1-84023-691-4. ^ a b c Brian Sibley (2006). Peter Jackson: A Film-maker's Journey. London: Harpercollins. pp. 236–40, 276, 324, 397. ISBN 0-00-717558-2. ^ a b c d e Anne Thompson (May 17, 1996). "The Apes of Wrath". Entertainment Weekly. Retrieved October 1, 2008. ^ Cindy Pearlman (December 10, 1993). "Monkey Business". Entertainment Weekly. Retrieved October 1, 2008. ^ a b Jeffrey Wells (December 23, 1994). "Monkey Business". Entertainment Weekly. Retrieved October 1, 2008. ^ Scott Brake (February 27, 2001). "IGN FilmForce Takes You to Planet of the Apes!". IGN. Retrieved October 2, 2008. ^ Paul F. Duke (February 22, 2000). "Fox goes Ape for Burton". Variety. Retrieved September 30, 2008. ^ Paul F. Duke (March 21, 2000). "Zanuck swings back to Apes". Variety. Retrieved September 30, 2008. ^ Army Archerd (April 19, 2000). "Zanucks urge Polanski to return to U.S." Variety. Retrieved September 30, 2008. ^ a b c d Richard Natale (May 6, 2001). "Remaking, Not Aping, An Original". Los Angeles Times. Retrieved September 29, 2008. ^ a b Mark Salisbury, Tim Burton (2006). Burton on Burton. London: Faber and Faber. pp. 187–190. ISBN 0-571-22926-3. ^ Tim Ryan (August 14, 2000). "Big Isle Lava Could Lure Film Visitor". Honolulu Star-Bulletin. ^ a b Dana Harris (January 8, 2001). "Fox, licensees go Apes for goodies". Variety. Retrieved September 30, 2008. ^ KJB (June 7, 2000). "The Island of the Apes". IGN. Retrieved October 2, 2008. ^ a b Benjamin Svetkey (April 27, 2001). "Ape Crusaders". Entertainment Weekly. Retrieved October 1, 2008. ^ Josh Wolk (December 18, 2000). "About Face". Entertainment Weekly. Retrieved October 1, 2008. ^ Amy Barrett (December 24, 2000). "Going Ape". The New York Times. ^ Horn, Steven (August 1, 2001). "INTERVIEW WITH TIM ROTH". IGN. Retrieved August 11, 2015. ^ "Roth's Fury At "Monster" Heston". Contactmusic.com. April 27, 2003. Retrieved August 11, 2015. ^ Tin Swanson (May 28, 2001). "Inside Move: Fox goes Ape online". Variety. Retrieved September 30, 2008. ^ Dana Harris (October 27, 2000). "Fox fires first salvo in summer '01 battle". Variety. Retrieved September 30, 2008. ^ a b "2001 Domestic Grosses". Box Office Mojo. Retrieved September 28, 2008. ^ "2001 Worldwide Grosses". Box Office Mojo. Retrieved September 28, 2008. ^ "Planet of the Apes (2001)". Rotten Tomatoes. Retrieved April 17, 2010. ^ "Planet of the Apes reviews". Metacritic. Retrieved April 17, 2010. ^ "Planet of the Apes". Roger Ebert.com. July 27, 2001. Retrieved September 29, 2008. ^ Peter Travers (August 19, 2001). "Planet of the Apes". Rolling Stone. Archived from the original on October 24, 2007. Retrieved April 17, 2010. ^ Kenneth Turan (July 27, 2001). "Some Serious Monkey Business". Los Angeles Times. Retrieved September 11, 2012. ^ Elvis Mitchell (July 27, 2001). "Movie Review - Planet of the Apes - FILM REVIEW; Get Your Hands Off, Ya Big Gorilla!". The New York Times. Retrieved September 11, 2012. ^ Susan Wloszczyna (August 2, 2001). "Great apes rule the new Planet". USA Today. Retrieved September 29, 2008. ^ "28th Saturn Awards". Internet Movie Database. Retrieved September 29, 2008. ^ "55th British Academy Film Awards". Internet Movie Database. Retrieved September 29, 2008. ^ "43rd Grammy Awards". Internet Movie Database. Retrieved September 29, 2008. ^ "22nd Golden Raspberry Awards". Internet Movie Database. Retrieved September 29, 2008. ^ Steven Horn (July 26, 2001). "Helena Bonham Carter Goes Ape". IGN. Retrieved October 2, 2008. ^ "'Planet Of The Apes': 1963 – 2011, A Look At The History". sciencefiction.com. Retrieved September 1, 2013. ^ "Vulture Exclusive: Fox's Planet of the Apes Reboot of the Reboot". vulture.com. Retrieved September 1, 2013. ^ Kroll, Justin (January 7, 2014). "Matt Reeves Will Return to Direct 'Planet of the Apes 3′". Variety. Retrieved September 3, 2014. ^ Adams, Tom (February 9, 2000). "IGNDC Monkeys Around with Planet of the Apes Producer Cos Lazouras". www.ign.com. IGN. Retrieved August 23, 2014. ^ a b "Ubi Soft and Fox Interactive kick off a global partnership, bringing Planet of the Apes to video games". www.bluesnews.com. September 6, 2001. Retrieved August 21, 2014. ^ a b D'Alessandro, Anthony (May 16, 2001). "Fox's Ape-athy". Variety. Retrieved August 23, 2014. ^ Sulic, Ivan (October 18, 2001). "Planet of the Apes (PC)". www.ign.com. IGN. Retrieved August 23, 2014. ^ Deci, T.J. (2014). "Planet of the Apes". www.allgame.com. AllGame. Retrieved August 21, 2014. ^ "Planet of the Apes (PC)". www.gamerankings.com. GameRankings. 2014. Retrieved August 23, 2014. ^ "Planet of the Apes (PlayStation)". www.gamerankings.com. GameRankings. 2014. Retrieved August 23, 2014. ^ Goldstein, Hilary (December 14, 2001). "Planet of the Apes (GBA)". www.ign.com. IGN. Retrieved August 12, 2014. ^ "Planet of the Apes (Game Boy Advance)". www.metacritic.com. Metacritic. November 30, 2001. Retrieved August 23, 2014. William Thomas Quick (July 31, 2001). Planet of the Apes (mass market paperback). HarperCollins. ISBN 978-0-06-107635-0. Novelization of the film. Mark Salisbury (July 27, 2001). Planet of the Apes: Reimagined by Tim Burton (hardcover). Newmarket Press. ISBN 978-1-55704-487-7. A detailed analysis of the making of the film.